This saint was born near the city of Montepulciano, Italy, in 1268. When she was just nine years old, she begged her mother and father to let her live at the nearby convent. Agnes was very happy with the sisters. They led a quiet, prayerful life. They worked hard, too. Even though she was young, Agnes understood why the sisters lived and prayed so well. They wanted to be very close to Jesus. The years passed. 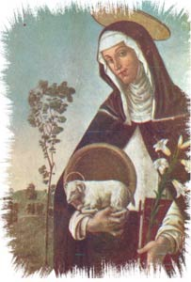 St. Agnes received her training as a novice. She was such a good nun that the other sisters were pleased to have her. Agnes prayed with all her heart. She gave the sisters a good example. Some young women came to join them. Agnes and the sisters belonged to the Order of Preachers, called Dominicans. Eventually, Agnes was chosen superior or "prioress" of the convent. She tried to be fair and honest with each sister. She kept reminding herself that everything she did was for Jesus. She believed that Jesus was really in charge of the convent. He was taking care of them. Mother Agnes performed hard penances. She was kind and gentle even when she didn't feel like it. God filled Agnes with joy and sometimes gave her spiritual favors. One time he even let her hold the Christ Child in her arms. Agnes was a sickly woman. But she was patient even when she was very ill. She never complained or felt sorry for herself. Instead, she offered everything to God. Toward the end of her life, the sisters realized she was not going to get better. They were very sad. "if you loved me, you would be glad," Agnes said. "I am going to enter the glory of Jesus." St. Agnes died in 1317 at the age of forty-nine. She was proclaimed a saint in 1726. Her tomb became a place of pilgrimage. Many people came to pray to this holy woman and to seek her help. Among the pilgrims was the famous St. Catherine of Siena. We celebrate St. Catherine's feast day on April 29. From St. Agnes we can learn that the Lord has something in mind for each of us. He gives us talents and opportunities to do our best with our life's calling. We can ask the Lord often to help us become what he wants us to.